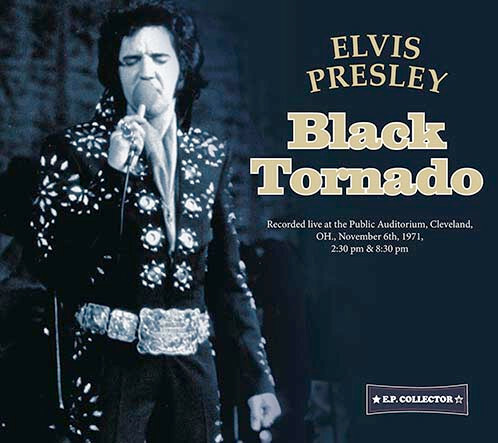 This 2CD is titled "BLACK TORNADO (E. P. Collector label, catalogue number EPC 2018-17A/B). Now, when majority of Elvis import labels is only re-releasing old stuff in new packages, E. P. Collector label is coming with another surprise! The Cleveland, November 6, 1976 Afternoon & Evening shows are previously unreleased and moreover, they were never available in listenable sound, until now! Elvis November ’71 tour was rated as one of Elvis’ very best in the 70s. Compared with previous tours in September and November 1970, individual shows were longer and set list was variable more than before. It was the only tour in 1971 and it was the last time when Elvis was accompanied by The Imperials, too. Elvis played 14 shows in 12 days in 12 different cities. Among the concert highlights there are fantastic performances of ,,Proud Mary“, „You’ve Lost That Loving Feeling“, „How Great Thou Art“ „I’m Leavin’“, „Bridge Over Troubled Water“, „Lawdy Miss Clawdy“ and „ The Impossible Dream“. Both concerts are taken from direct transfers of recently-found original audience-recorded cassette tapes. Those shows were recorded by Elvis fan Joyce Bauer, who passed away a couple of years ago. She followed much of Elvis' 1971 tour in November, and her tapes have never been in circulation before. You may ask your supplier for samples. This CD is packaged in a nicely designed double digipak with collection of images taken during both shows, reprints concert tickets and various press reviews and newspaper clippings. If you have enjoyed our previous releases called „The First Time Ever I Lay With You“ and „Looked Into The Wings”, then you are sure to enjoy our latest release, too. 01. Also Sprach Zarathustra (2001 Theme) - 02. That’s All Right - 03. Medley: I Got A Woman / Amen - 04. Proud Mary - 05. Love Me Tender (with false start) - 06. You Don’t Have To Say You Love Me - 07. You’ve Lost That Loving Feeling - 08. Polk Salad Annie - 09. Instrumental / Introductions - 10. Johnny B. Goode - 11. Love Me - 12. Heartbreak Hotel - 13. Blue Suede Shoes - 14. One Night - 15. Hound Dog - 16. How Great Thou Art - 17. Band Introductions - 18. I’m Leavin’ - 19. Blue Hawaii (excerpt) / Hawaiian Wedding Song - 20. I Can’t Stop Loving You - 21. Bridge Over Troubled Water (with reprise) - 22. Lawdy Miss Clawdy - 23. Can’t Help Falling In Love - 24. Closing Vamp. 01. Also Sprach Zarathustra (2001 Theme) - 02. That’s All Right - 03. Medley: I Got A Woman / Amen - 04. Proud Mary - 05. Love Me Tender - 06. You Don’t Have To Say You Love Me - 07. You’ve Lost That Loving Feeling - 08. Polk Salad Annie - 09. Instrumental / Introductions - 10. Johnny B. Goode - 11. Love Me - 12. Heartbreak Hotel - 13. Blue Suede Shoes - 14. Hound Dog - 15. The Impossible Dream - 16. Bridge Over Troubled Water - 17. Band Introductions - 18. I’m Leavin’ - 19. Suspicious Minds - 20. Can’t Help Falling In Love - 21. Closing Vamp. Excellent concerts....and the sound is not too bad....I take it.